Location: North side of Bridge Road, immediately west of the main line. 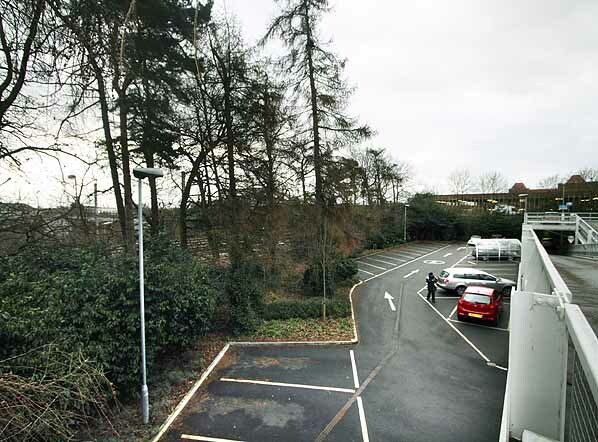 The boundary of a Waitrose store car park follows the curve of the branch. Notes: When the second stage of the Dunstable line opened on 1st September 1860, Welwyn Garden City didn't exist. The line made a junction with the Great Northern within what is now Welwyn Garden City, and ran south along the main line into Hatfield station. In December 1868 a new parallel line into Hatfield was brought into use for the branch service, and the earlier junction was removed in January 1869. In 1919, Sir Ebenezer Howard arranged for the purchase of land in Hertfordshire that had already been identified as a suitable site for a new town. On 29th April 1920 a company, Welwyn Garden City Limited, was formed to plan and build the garden city, similar to the one he had founded at Letchworth in 1903. To help with the transport of both workers and building materials to the construction site, temporary wooden platforms were built on both the Dunstable and Hatfield branch lines. The platform on the Dunstable route was actually at the point where it curved away from the Great Northern main line. The platform opened on 14th August 1920. The majority of workers commuted from London, and special trains were chartered running from Kings Cross to Finsbury Park, then fast to the new platform. Having discharged their passengers they ran on to Ayot to reverse before returning to Hatfield, probably on normal passenger duties. The trains returned in the evening to take the workers back to London. The platform was on the down side of the line and had a large timber building incorporating a waiting room and ticket office, with a ticket window on one end of the building. When the platform was built a signal box was also provided at the junction, on the up side between the branch and the Great Northern line. Although both platforms were for workers only, that on the Dunstable line became a public station. The name Welwyn Garden City is shown on its running in board, but in timetables (see below) it was shown as Welwyn Garden City Halt. The station closed on 20th September 1926 when a new station was opened at Welwyn Garden City 200 yards to the south. The platform was quickly demolished. The London & Birmingham Railway opened the first section of its line between London Euston and Boxmoor (Hemel Hempstead) on 20th July 1837 and from Boxmoor to a temporary northern terminus at Denbigh Hall on 9th April 1838. The line had originally been planned to pass through Buckingham, but opposition from the Duke of Buckingham ensured that it was forced east through Linslade. One of the intermediate stations opened with the second part of the line was at Leighton, ¼-mile south of the Linslade tunnels. Leighton was the nearest station to Luton, which was developing as an industrial town in the early 19th century. Although a direct stagecoach service between Luton and London had started in 1810, and Dunstable, to the west, was on an existing busy coach route, neither could serve the needs of the area. A branch line from Luton to the London & Birmingham at Leighton was proposed by George and Robert Stephenson in 1841, and it initially received considerable local support. Nothing was done until 1844 when a meeting was held in Luton. 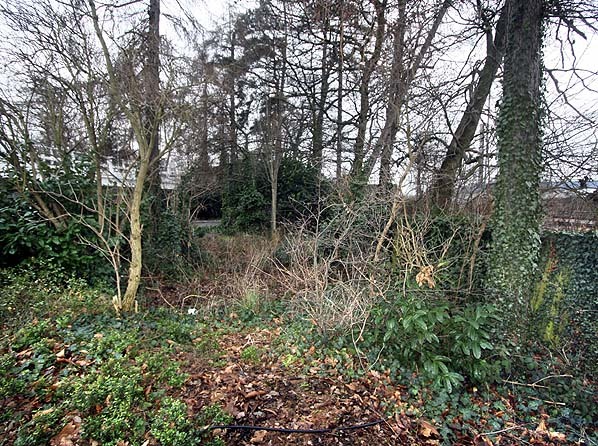 By now there was mounting opposition to the scheme which would have to cut across the 'Great Moor', a large area of undeveloped common land close to Luton. This angered George Stephenson who vowed that Luton would not get a direct railway connection to London as long as he lived. line from Luton to the new line at Dunstable once it was completed. Many people preferred a counter proposal for a direct line between London and Manchester passing through Luton, which would be 14 miles shorter for passengers travelling to London, avoiding the need for a change of trains at Dunstable and Leighton. Another option was to build a branch to the Great Northern Railway's London to York line which was already under construction and would pass 12 miles to the east of Luton. The direct route was chosen as the best option which, at that time, left Luton without a railway while other branch lines in the area were already being planned and built. The double-track Dunstable branch opened on the 1st June 1848 with a terminus on the west side of Watling Street and no intermediate stations (although a station at Stanbridgeford was opened in November 1860). By 1851 Luton was the largest town in Bedfordshire without a railway or canal to cater for its increasing industrial growth. In 1853 the GNR was approached to build a branch to their line at Hatfield, but this was turned down. On 3rd July 1854 the Hertford & Welwyn Junction Railway received parliamentary authority to build a line from the North Eastern Railway at Hertford to the GNR at Digswell, and on 30th September 1854 there was a proposal to extend this line across the GNR to Luton and Dunstable linking three established railway companies (NER, GNR & LNWR). Not wanting to be left out, the GNR offered to work the line between Hatfield and Luton although it was not prepared to provide any finance. The Luton, Dunstable & Welwyn Junction Railway Act was passed on the 16th July 1855 authorising a junction with the LNWR at Dunstable and a triangular junction with the GNR at Digswell together with a bridge over the GNR to allow through running over the H & WJR between Hertford and Dunstable. All three companies were authorised to work the line. A single track was built (with the intention of doubling in the future) with construction starting on 16th October 1855 which, in Luton, was designated as a half-day public holiday as residents had waited so long to get a railway! Unfortunately the company was unable to raise sufficient capital to purchase all the necessary land between Welwyn and Luton. The LNWR refused to help by leasing the line although they did offer to work the line for two years after completion. In an attempt to save the line an amalgamation between the H & WJR and the LD & WJR was proposed. This was bitterly opposed by a minority of disgruntled Luton shareholders who claimed that passengers would be forced to travel to London via the Eastern Counties main line at Hertford rather than using the shorter GNR route via Hatfield. The amalgamation and formation of the Hertford Luton & Dunstable Railway was passed at a heated meeting on 26th January 1858, but although both lines were completed and approach embankments were constructed, the linking bridge was never built due to restrictions imposed by the GNR. The Hertford line was opened to passenger traffic on 1st March 1858 between Hertford (Cowbridge) and a short-lived station at Welwyn Junction on the GNR. Work on the Luton line had been progressing during the amalgamation negotiations, and at a shareholders’ meeting on 6th August 1857 it was announced that the first section of the line between Luton and Dunstable was ready for goods traffic. Several goods wagons were fitted with seats to take shareholders along the line. The line was initially inspected on 18th March 1858 and, after a turntable was provided at Leighton at the request of the Board of Trade inspector, the line was passed a month later, with a goods service running from 5th April 1858 and a passenger service from 3rd May 1858; large crowds travelled to Luton station for a day to take part in the celebrations and ride on the new line. Initially there were five trains in each direction on weekdays only; two of these were later extended to Leighton. At this time Luton trains used a new station in Church Street, Dunstable, with through trains to Leighton bypassing the LNWR station which was at a lower level. Initially an end-on connection had been proposed which would have required raising the level of the road by three feet to provide a level crossing. This was rejected by Parliament, so a diversion was authorised in 1856 taking the new line over Watling Street, rejoining the Leighton line to the west of Dunstable station. A proposed new station at the junction was not built at that time, although through trains from Luton could back into the LNWR station if required. April 1860 the HL & DR informed both the Eastern Counties Railway and the GNR that they were ending the 1858 agreement. The GNR immediately took steps to take over the line because of its strategic importance as a link between the three main lines; a Parliamentary Bill was prepared to facilitate this. At this time the line was nearing completion, with a special train carrying LNWR officials on 12th June and another 'special' on 17th July for company shareholders. After passing its Board of Trade inspection, the line between Luton and the Great Northern was opened to both goods and passenger traffic on 1st September 1860 with intermediate stations at New Mill End, Harpenden and Wheathampstead. At this time a Sunday service was introduced for the first time. There was a junction with the GNR at Welwyn, but no station was provided, and the H & WJR station at Welwyn Junction was closed with trains on both lines terminating at Hatfield. In 1864 there were six daily down trains between Hatfield and Leighton, with five up trains. There were a further two down trains between Luton and Leighton in the early morning with two up trains in the afternoon and evening and one train in each direction between Hatfield and Dunstable. On Sundays there were two down trains between Hatfield and Dunstable, with one up train with two short-running services. The Hertford, Luton & Dunstable Railway was absorbed by the GNR under the Great Northern Railway Act of 12th June 1861. This gave the GNR exclusive rights to operate the line, although a clause in the Act gave the LNWR joint rights to use the section between Dunstable and Luton. In December 1868 new parallel lines into Hatfield were brought into use for the branch services, and the earlier junctions were removed in January 1869. Although built as single track throughout, it was always the intention that the line would be doubled, and sufficient land was acquired over some of the route. In the late 1890s the Great Northern line between Digswell and Hatfield was widened with a new track being provided for Dunstable trains, and the old Dunstable line becoming the new down slow main line In 1890 passenger numbers were sufficiently high for doubling the line between Luton and Dunstable. This was authorised by Parliament in 1891, but progress was slow and it did not open until 10th September 1899. Proposals to double the remainder of the line brought a lukewarm response from the GNR. Passenger numbers increased through the 1890s, and by 1900 there were nine trains in each direction between Luton and Dunstable, with eight in each direction between Luton and Dunstable and seven between Dunstable and Leighton. In 1920 the new town of Welwyn Garden City was founded by Sir Ebenezer Howard, following his previous experiment in Letchworth Garden City. Howard had called for the creation of planned towns that were to combine the benefits of the city and the countryside and to avoid the disadvantages of both. During the construction of the new town, temporary contractors’ halts were provided at the junction of both the Hertford and Luton lines, close to the site of the earlier Welwyn Junction station. The halt on the Luton line became a public station on 14th August 1920, remaining in use until 20th September 1926 when the new Welwyn Garden City station was opened. Through the 20th century the line remained very profitable, due in part to the large number of private sidings, in particular those serving chalk quarries near Dunstable, the sand and gravel pits around Leighton Buzzard and, later, Vauxhall Motors in Luton. Following the 1923 general grouping the Dunstable branch became part of the London Midland & Scottish Railway while the Hatfield to Dunstable line was part of the London & North Eastern Railway. This split continued after nationalisation in 1948 with British Railways Eastern Region being responsible for the Hatfield line as far as Harpenden down distant signal, with the remainder of the line coming under the London Midland Region. On 2nd April 1950 the boundary was adjusted, transferring Harpenden (East added on 25th September 1950) to the LMR. Diesel-hauled freight trains started replacing steam in February 1959, and passenger trains in June 1959, the latter being replaced with DMUs in 1962. In common with many other branch lines passenger numbers went into rapid decline in the 1950s. The Sunday service was withdrawn on 21st January 1951, but a service of seven down and five up trains between Hatfield and Dunstable was maintained until closure of the line with four trains in each direction between Dunstable and Leighton Buzzard. The passenger service between Dunstable North and Leighton Buzzard was withdrawn from 2nd July 1962 with the last 'Dunstable Flyer', as it had been nicknamed, running on 30th June. Two enthusiasts’ specials travelled along the line after closure, both arranged by the South Beds Locomotive Society: the first on 22nd September 1962 ran between Luton and Banbury and the second, the 'Cobbler Tour', on 19th September 1964, ran from Luton to Leighton Buzzard and on to Newport Pagnell, returning to Luton via the Midland main line. The line remained open for freight traffic until 1st January 1966 after which it was cut back to Grovebury sidings south of Leighton Buzzard, serving sand and gravel pits, until final closure on 5th December 1969. Track-lifting was piecemeal, starting at Dunstable in late 1968 but not reaching Stanbridgeford until July 1969. Track-lifting west of Stanbridgeford started in February 1970 and was not completed until February 1971. National Cycle Route 6 now follows what is now known as the Sewell greenway between Stanbridgeford and Dunstable. The Hatfield line was scheduled to close on 6th January 1965 as part of the Beeching cuts. Closure was deferred following local objections - but only until 24th April when the last 'Skimpot Flyer' carried a wreath and a large number of passengers on a farewell journey along the line: it returned to Hatfield almost empty! The line remained open for freight and for goods traffic to Luton Bute Street until 26th June 1967. After that date the line between Luton and Dunstable was singled and retained to serve the Dunstable Cement works at Houghton Regis, with a new connection from the Midland main line at Luton opening in November 1965. The east end of the line was also retained for rubbish trains bound for Blackbridge sidings east of Wheathampstead. Track lifting on the remaining section between Blackbridge and Luton started at the Eastern Region/London Midland region boundary west of Harpenden East station on 8 May 1966 towards Luton and from 26th February 1967 towards Blackbridge. Blackbridge sidings closed in May 1971, and much of the track between Welwyn Garden City and Wheathampstead now forms the Ayot Greenway cycleway and footpath, with the the trackbed between Luton Hoo and Harpenden is incorporated into the 50-mile Lee Valley Walk. A number of enthusiasts’ specials visited the remaining line between Luton and Dunstable. In October 1968 a special train ran from St Pancras to Bedford, returning to Luton, where it was the first passenger train to use the connection between the Midland and Bute Street station. It continued to Dunstable North as part of the Midland Railway London Extension centenary celebrations. The last passenger excursion was on 17th January 1987 when Hertfordshire Railtours’ 'Chiltern Chariot' visited the line running to the Dunstable cement works via the Vauxhall sidings. The line was finally closed to all traffic when trains to the oil depot, on the site of the Great Northern goods yard at Dunstable North, were withdrawn in 1989, by which time the line had just one train per week. Apart from the section through the site of Bute Street station, the track was then mothballed. In the early 2000s the South Midland Railway Group set up a base in the ex-Bedford Trucks sidings on White Lion Retail Park at Dunstable and planned to form a transport heritage centre. The site was linked to the mothballed line to Luton via an illegally reinstated connection which the group hoped to reopen in the long term. The lease of the yard, however, was not secured, and in July 2001 it was reported that the group was in dispute over their occupation of the site. The project ended when the illegal connection to the Luton to Dunstable branch line was removed in March 2001, and vehicles were removed in July 2001 and January 2002; the remaining railway vehicles on the siding were finally cut up by the council, and the tracks were lifted in 2005. 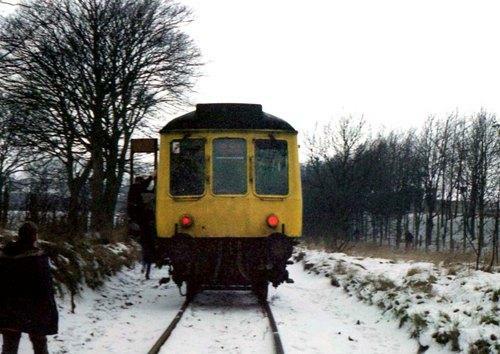 In December 2003 the Department for Transport approved the Transport & Works Act submission for a £85m scheme to convert the line into a guided busway. Planning permission and a Transport & Works Order were granted in November 2006, and the Transport Minister gave the go-ahead in August 2008. Tenders for its construction were sought in July 2009. In May 2009 a group called the South Bedfordshire Railway was proposing to set up a short heritage railway at Dunstable alongside the proposed busway. Luton Borough Council said the scheme might be possible if a society and funding were in place by winter 2009. The group was unable to meet the deadline. The overgrown track was cleared of vegetation in spring 2010, and funding for the busway was approved in June. Track-lifting between Luton and Dunstable began in autumn 2010 and was completed in January 2011. Three bridges, including one immediately north of Dunstable Town station, were demolished in October 2010. The 'Luton to Dunstable Busway' (previously known as Translink) will link Luton airport and Houghton Regis following the former railway line between Luton and Dunstable and the route of the siding to the Dunstable cement works at Houghton Regis. It will open in 2012. Sources: Wikipedia (Leighton Buzzard station) and the Hatfield, Luton & Dunstable Railway by G & S Woodward (1977). Published by Oakwood Press ISBN 978-0-853614-58-6. For further reading see Hertfordshire's lost railways by Keith Scholey ISBN ISBN 1 84033231 X and Bedfordshire's lost railways by Keith Scholey ISBN ISBN 184033 271 9 and Branch Line to Dunstable by Sue & Geoff Woodward (2008) Published by Middleton Press ISBN 978-1-906008-27-7. Other web sites: Lost lines - features photos taken along the line between 1989 - 2007. BBC Beds, Herts & Bucks web site. Disused Railways web site. 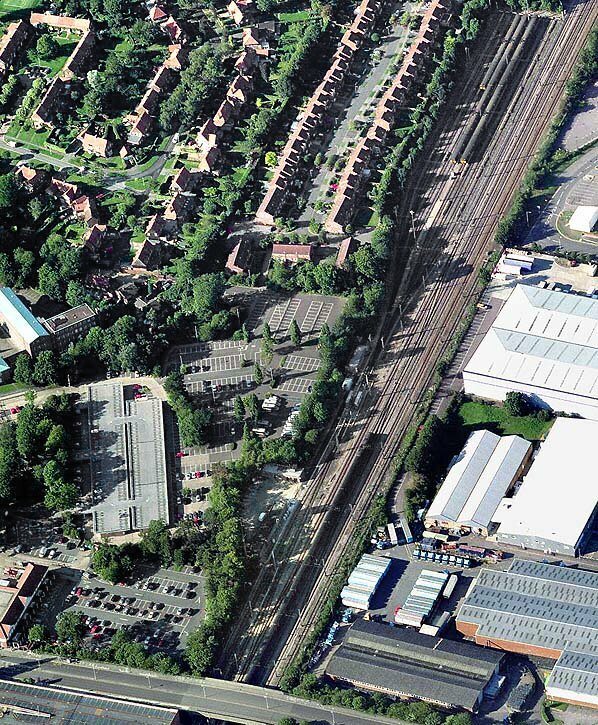 Click here to see an aerial view of the whole Leighton Buzzard - Dunstable line on Google Earth. All the stations are shown. Prepared by Mark Percival. 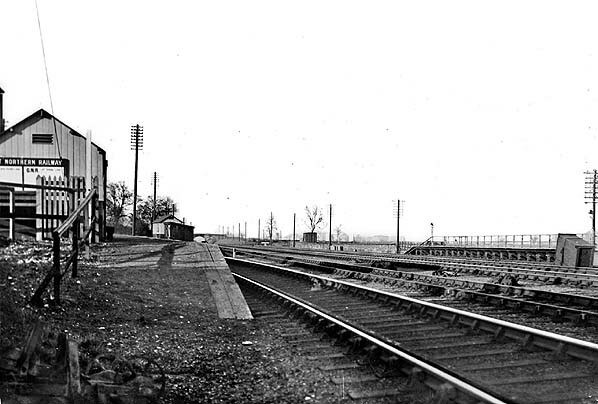 Welwyn Garden City Halt (left) in 1921. The platform on the right is a workmens' platform on the Hertford North line for people working on the construction of Welwyn Garden City. This is approximately on the site of the earlier public Welwyn Junction station on the Hertford line which closed in 1860. 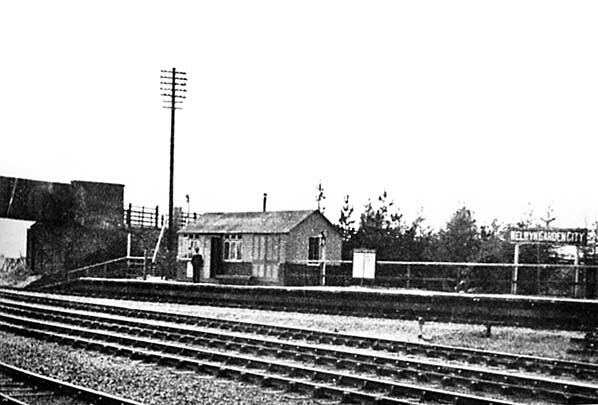 Note the signal box at the junction. 1878 1:2500 OS map. The junction with the Dunstable line is shown but there were no stations there at this time. 1898 1:2500 OS map. The new road and bridge is under construction at this time. 1923 1:2500 OS map. Both Welwyn Garden City Halt on the Dunstable line and the workers halt on the Hertford line are shown. Welwyn Garden City Halt was very busy during the construction of Welwyn Garden City, with many workers commuting from London each day. The loco is an N2 tank engine with a workers' charter in the early 1920s. 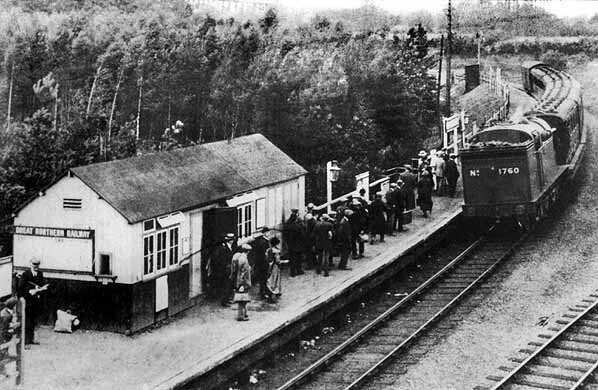 Welwyn Garden City Halt, probably seen from the contractors' platform opposite in April 1921. The site of Welwyn Garden City Halt looking north in January 2011. Looking south towards the junction at the site of Welwyn Garden City Halt in January 2011. This aerial view clearly shows the course of the line from the junction. The site of the Hertford line junction can also be seen top right.